I finally did it! We have a pretty big piece of land so it was kind of scary running across it named in the middle of the night. But once I got over the property line, I threw the walnuts against the first big tree I saw and ran home. I feel better already! 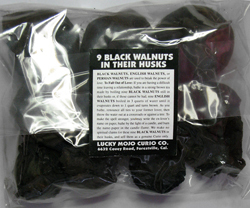 I just did the black walnut bath last night. How long is it supposed to take to work?